Regardless of whether you are a professional or an amateur welder, the fact remains that you’ll find your work much more comfortable with a reliable, high-quality welder. Is Hobart Handler 140 The Right Welder For You; What Can It Achieve? What Will You Receive If You Order? However, a majority of such machines are bulky and costly. 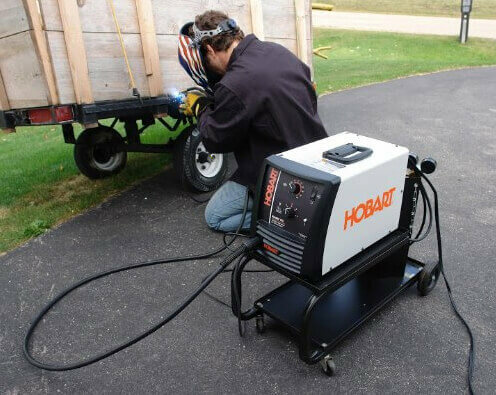 The Hobart line of welders offers good and high-quality products at very competitive prices. Almost any Hobart Handler 140 review you come across on the internet tells you that this machine fits that description. You might have seen or read other online reviews of the Handler 140 welder, but here you’ll get to know all the necessary info about this product and why it is one of the best you can buy. Towards the end, we will look at Hobart 140 vs. Lincoln 140 just in case you are torn between these two options. Featuring the American manufacturing pride, this unit offers you an excellent user interface that is at par with the latest technology in the industry. Every component the design of the welder depicts high quality and brilliant workmanship. If you prefer a compact but powerful welding machine, the Handler 140 offers you much more. This piece of equipment is the second most compact MIG/Flux Core welder in Hobart’s line. This makes it a perfect choice for DIY projects and home improvement tasks. Amazingly, the unit can run off the standard 115v power source in your home. It weighs a paltry 57 lbs making it easy for you to move it from place to place as you do your work. There is no excellence when it comes to mechanical and electronic products. But a product is deemed reasonable if its pros outweigh its cons. Such is the case with the Handler. Although compact, it is a leading contender if you desire top-quality welding results from heavy-duty welder without digging too deep into your pocket. The machine is incredibly versatile. You can weld a seemingly limitless number of items both in professional settings and at home. For instance, you can weld barbecue pits or devices, sporting equipment, ornamental designs, trailer, work machinery, and artistic works among other things. Do not despise the minimalist design of the Handler; it will give you the performance of a workhorse taking the beatings and delivering excellent results each day. Thus you won’t have to rest it even when you have a string of professional welding jobs to finish. 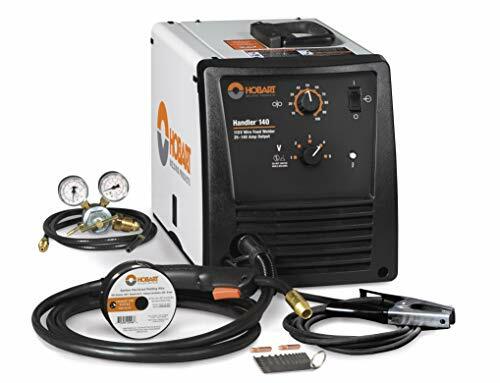 While the fame and simple design of this compact MIG/Flux core welder are comparable to several models out there that are costlier, it delivers incredibly strong power of 140 Amperes. However, the machine’s versatility allows running between 25A and 140A. With such power and its MIG function/capacity, you can weld materials ranging in dimensions from 24 gauges up to mild steel 0.75 inches thick. The Flux core function option is excellent if you have to work with thicker materials. Additionally, this welding machine offers you a duty cycle of 20 percent at 90 Amperes. This is much more than what you need for household and DIY metal fabrication applications. Keep in mind that the Handler 140 from Hobart is not designed to be powered by a generator. So, it will not be of benefit to you if you plan on welding outdoors far away from a safe and reliable power source. Nonetheless, if you have the standard mains electricity supply of 115v (as we know most of us do), plug the machine in and you are good to go. Does this mean it is utterly impossible to use it elsewhere from home? We’ say no. If you can get a long cable to act as an extension, why not bring the power supply where the machine is, if possible. Like Lincoln 140 welder, this unit is way lighter than most professional grade models. Weighing only 57 lbs, you can just pick it up and off you go especially if you need a welding machine for your peripatetic work routines. Ten feet long MIG gun and ground clamps lead lets you to carry out jobs without having to drag or pull the welder along. The gun makes use of regular consumables. So, picking up tips at your local hardware store is a breeze. Even more relaxing is that Hobart provides you with an optional extra in the form of a unique cart with wheels which makes moving with the welder a breeze. It also does not take much space in your trunk if you have to carry it along with other supplies. These performance-oriented features mean the Handler is ideal for construction work, maintenance, farm use, home remodelling jobs, auto body works and rental shop applications among others. 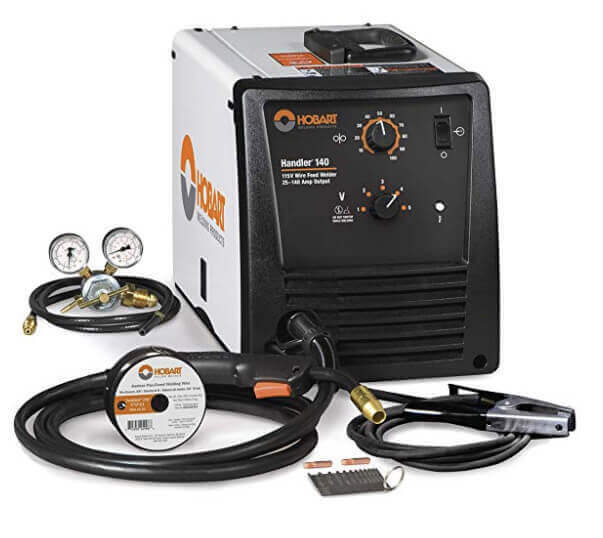 Arc control gives the power source of your welder variable extra amperage during low voltage to avoid sticking or guarantee smoothness in welding. The materials you use notwithstanding, you are guaranteed an arc that is steady and smooth most, if not all the time. This capability is the function of Handler’s voltage regulator that features 5-knob settings to pick from. Thus you can select a desirable alternative for your metal fabrication needs. Sturdy, Rustic Build: Out of the box, you’ll notice how sturdy and rustic the welder is. Hobart manufactures the machine using durable, rugged steel. The gun and cable are nicely built and lightweight to give you an enjoyable and tireless working experience. Optimum Safety: The unit combines several built-in safety features to ensure that you work safely. For instance, a temperature overload system resets itself ensure the welding remains secure until you engage the trigger. It also protects you from a dangerous power surge. Delivered Ready to Use: When you place an order, the unit will come with all you need to start with MIG welding. You won’t need to part with a penny to buy any extra equipment. This further reduces the overall cost of purchasing the machine. Helpful User Manual Included: It won’t take you long to set up the welder for use. Once you do, you find it very easy to use. If for any reason you get stuck, a guide will quickly get you out of the quagmire. The manual has answers and solutions to any possible problems you might encounter. 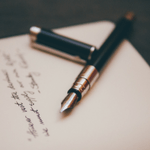 Once you make an order and completed the necessary steps, expect to receive the following in the package that will be delivered to your door. It is not possible for any mechanical or electronic product to be flawless. However, we consider a product good quality if its benefits outweigh any potential flaws. Here are summaries of the pros and cons to give a good idea of what you’ll get if you buy this product. Excellent welding results – great penetration with clean, very smooth welds. Superior construction quality means years of optimum service. Great for beginner and amateur welders since it uses the standard household current. Extremely versatile for a large variety of welding applications. Very safe to operate, handle, transport and store. Robust, high-quality rustic design but affordable. Smooth, steady arc control every time regardless of the material you use. Impossible to use with generators – limits outdoor use. Challenging to establish smooth wire feed when flux score welding. MIG welding needs a gas cylinder.You’ll have to buy this separately. Can’t choose between Handler 140 and Lincoln 140? Do not worry. You are not alone in the quagmire. Both these welders offer a maximum power output of 140A, are rated 20% at 90Amps duty cycle, and they have similar applications. It means there are only slight differences between these two incredibly similar items. In terms of weight Handler weighs 57 lbs which is 7 pounds heavier than Lincoln 140 which weights 50 lbs. A slim difference also exists in output current. While Lincoln offers 30-140A, Handler provides 25-140A. This does not make any significant difference because both can allow you to weld at low voltages to increase the duty cycle. Another tiny difference is in the wire feed speed. Lincoln 140 is rated at 50-500 inches per minute (IPM) while Handler 140 rate is 40-700 IPM. Perhaps the most significant difference is in the voltage control.The welder from Hobart features a 5-position voltage selector knob; its counterpart only features two. This gives Handler more flexibility than the Lincoln 140. Generally, these two products are on par in performance. So, if you do not like the Handler welder for any reason, you can choose the Lincoln 140. Either of the two is suitable for beginners and amateur metal fabrication tasks. We hope you have benefited from this in-depth Hobart Handler 140 review. We have made sure no stone is left unturned in our quest to provide you with all kind of info necessary for you to make an informed decision. The high-quality performance and affordability of the Hobart 140 should give you the confidence to buy it. No doubts why it has got hundreds of great reviews on Amazon. Do share your thoughts in the comments section below. Also, let us know if you still have any doubts regarding the Handler 140. We would be happy to help you make a wise decision.